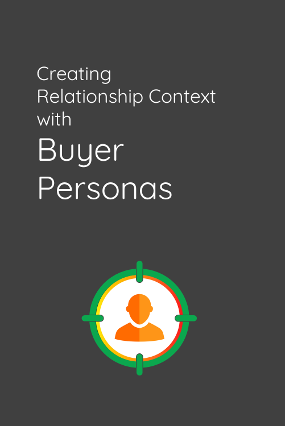 Buyer personas describe in detail who your buyers are. Assumptions about your target audience can cause a disconnect between your strategies and your customer’s interests. If you can identify your top customers, you can pinpoint their business pains, understand how they communicate and get on the right platforms to attract their attention. In order to create personalized relationships, you need to really understand what motivates and drives your customers in different segments of your lists. Why do your customer personas matter? In the physical world, when enrolling a prospective customer, a sales member will relate to the lead in context at a human level. This allows connecting and communicating in a fluid way. 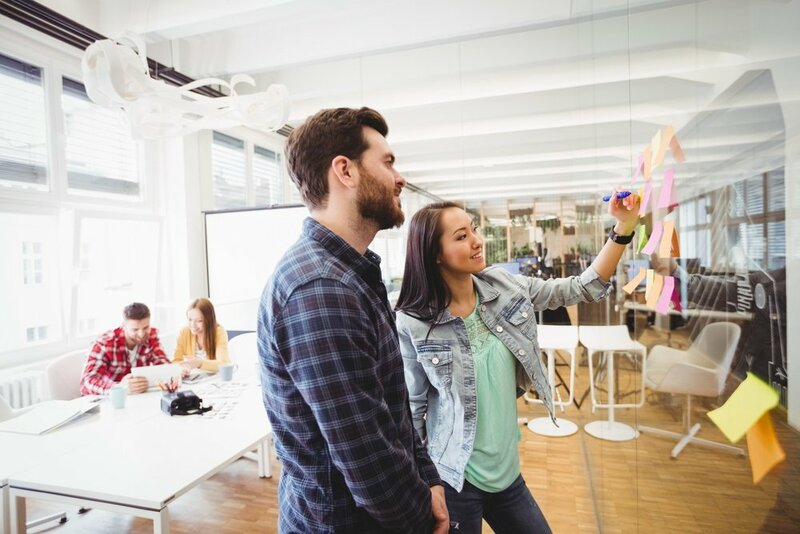 The same is true in the digital world; when you know who your customer personas are, you can connect and communicate in an authentic and relevant way. We begin by defining the market segments that best align to our value proposition. Next, we identify who the buyers are in those market segments. We then flesh out the wants, needs, habits and trends of those customers, forming our buyer personas. In today’s world, we have unprecedented tools and data that allow us to define who these customer personas are with precision and speed. 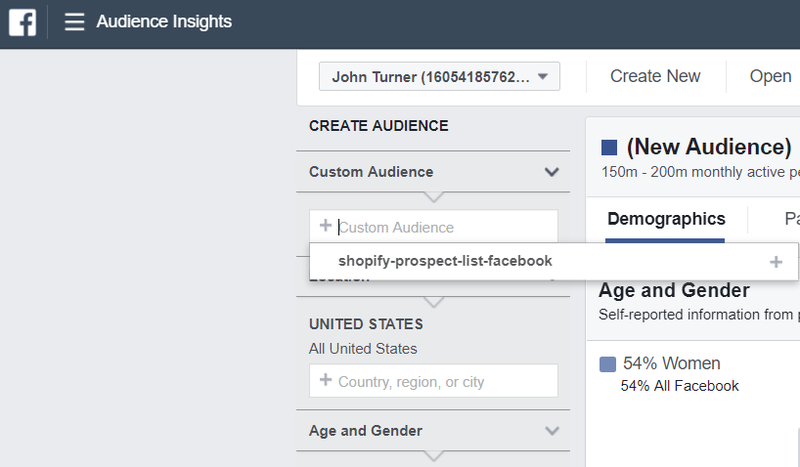 Facebook Audience Insights is one amazing tool that makes this possible. 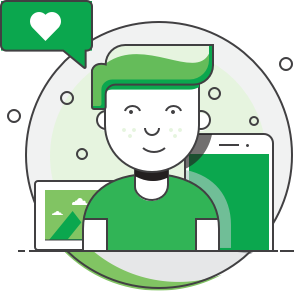 Customer personas can empower you to improve your products and services based on your customers’ needs. They can help you create content that aligns with your customers’ context – allowing you to facilitate them naturally through a buyer’s journey. Download your existing customer list to include email addresses or phone numbers into a CSV file. 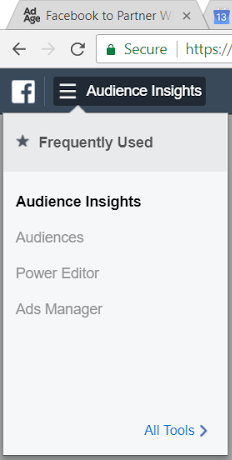 Next, go to Facebook Ads Manager, select the Tools menu, and select Audiences. There you’ll see a dropdown menu called Create Audience; in that menu, choose Custom Audience. Select Add customers from your own file or copy and paste data. Click Upload File and upload your data. 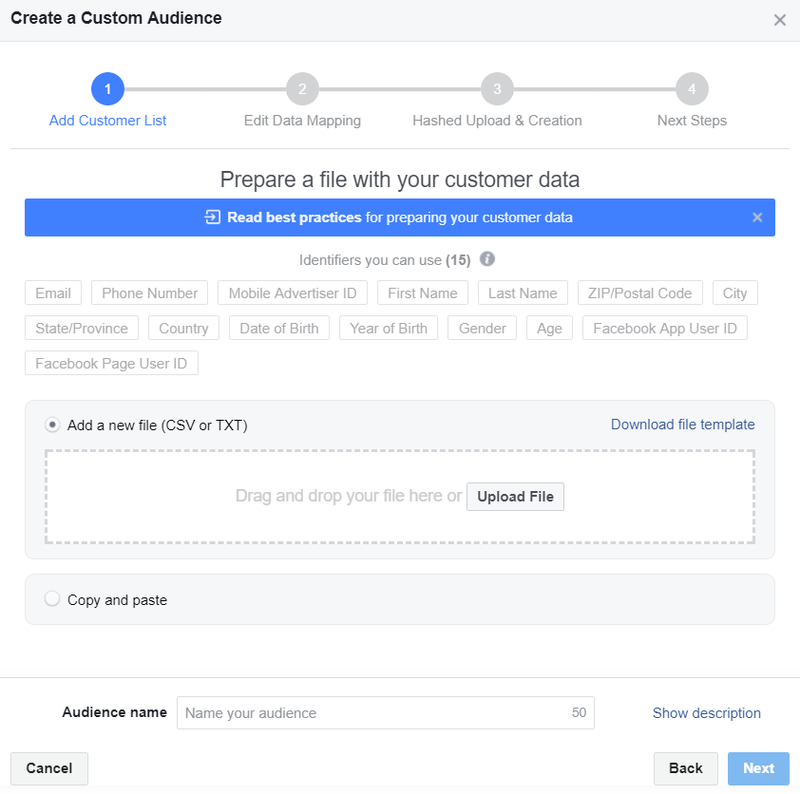 After Facebook Audience Insights processes the uploaded list, you’ll see a ‘Ready’ notification. It may take up to an hour to receive the ‘Ready’ notification, so be patient. Once the data is ‘Ready” you’re ready to analyze your Custom Audience. 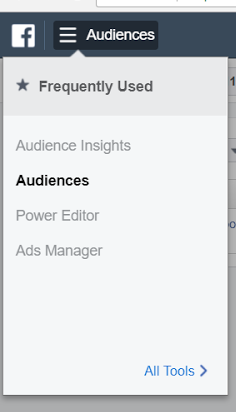 Next, go to your Audience Insights tool, which is found under the Tools menu in your Facebook Ads Manager. You’ll then be prompted to choose an audience to analyze. Select one or more of the Custom Audiences you’ve created. Once selected, you’ll see the data presented in Audience Insights. This data is grouped by: Demographics, Page Likes, Location, Activity, Household and Purchase. 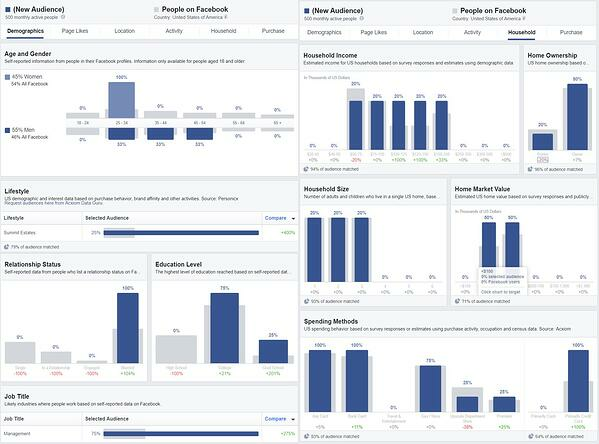 Below is a small snapshot of the wealth data available in Facebook Audience Insights. 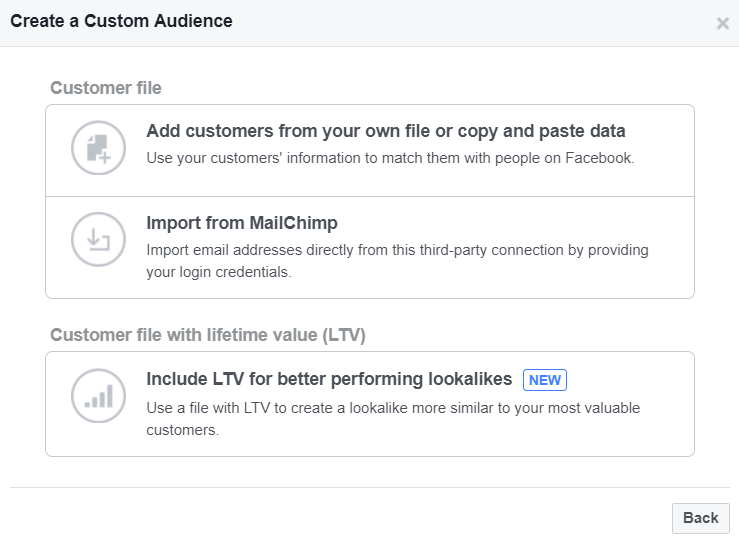 Now that you have Audience Insights data, you can now use this data to create customer personas. When creating the customer persona, you want to describe a real person as if you were going to introduce this person to someone. For example, your customer persona could be summarized as follows. Diane is a 30-year-old married woman and with 2 children. She’s got a college degree in marketing, makes $90,000 a year and owns a home worth $400,000. 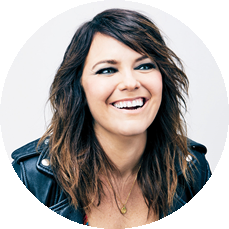 She drives a luxury SUV car and predominantly eats out and purchases fashionable clothing and beauty products, and subscription services. She listens to NPR and watches liberal and progressive news on TV and listens to podcast. Once your persona has been created, match a photo that you think best suits this person. 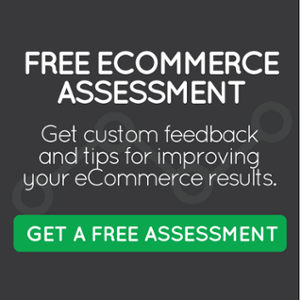 Repeat this process for each segment you serve, and buyers within those segments until you’ve developed a full suite of personas that accurately reflect your target customer base. Now that you’ve created your customer personas using Facebook Audience Insights, it’s time to create a buyer’s journey for each persona.